maybe i missed it but i didn’t see a thread that has all of our setups. it’s time. i like looking at these types of threads to give me ideas on how to switch up my stuff. which i end up doing 3-4 times a year. but oddly enough, i still prefer the floor. 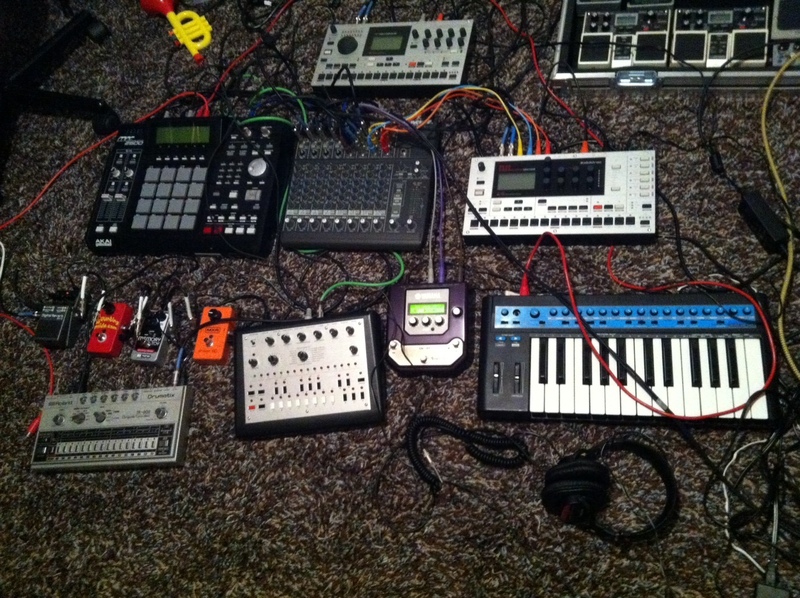 X-Station that acts as my interface and key’d input to soft and hard synths. 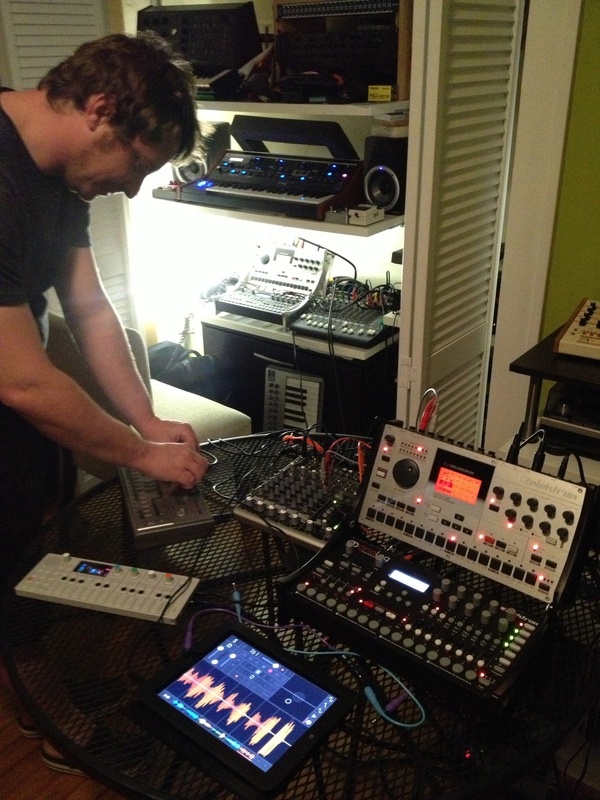 The OT runs the show and drives the midi for the Tetra and iPad as well as Ableton/Maschine. 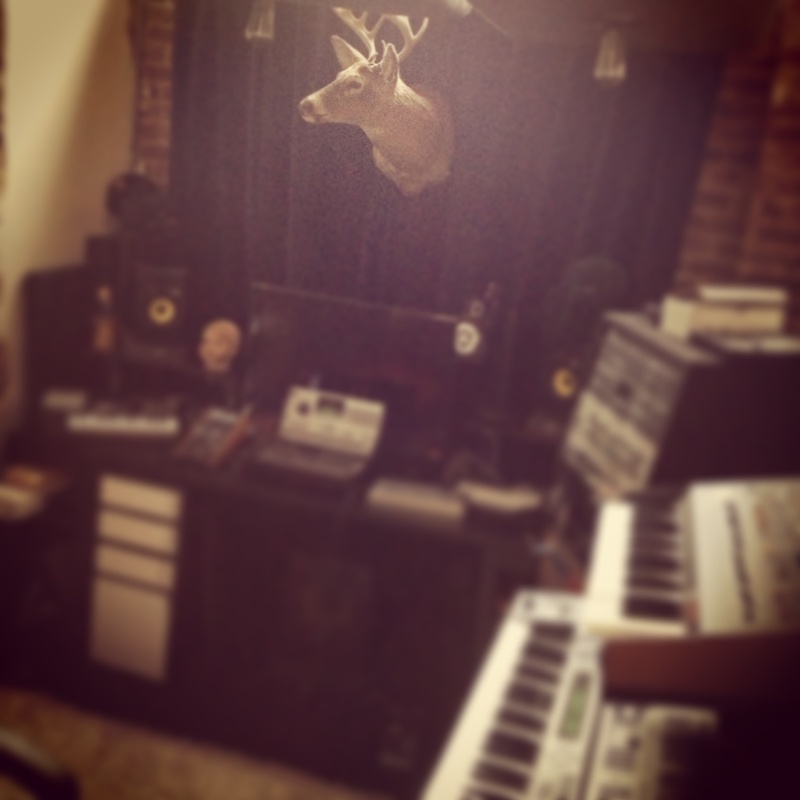 I can play drums and keys on my Maschine/X-Station and can input into whatever I like. 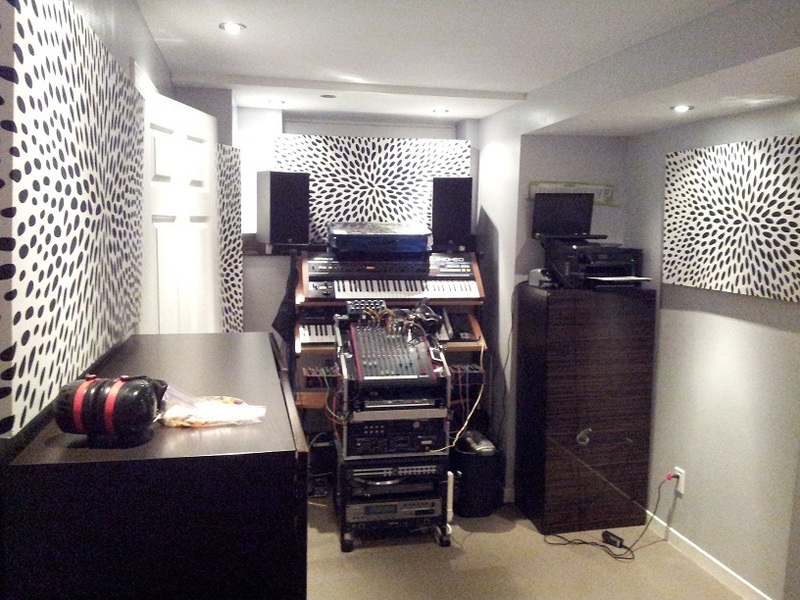 Sticking to mono audio just now with 2 inputs into OT for drums and synths/other from laptop. 1 input taken up by the A4000 which is routing audio from the Tetra and the final input used by the iPad. I like the A4000 as an effects unit, still finding my feet on how to work things well with the OT but certainly getting there. Ultimately I will probably re-route audio back into Live at some point but thats not for the now. Can look at that later! Up untill 1.5 year ago I was back at working software only (coming from quite an extensive hardware setup). 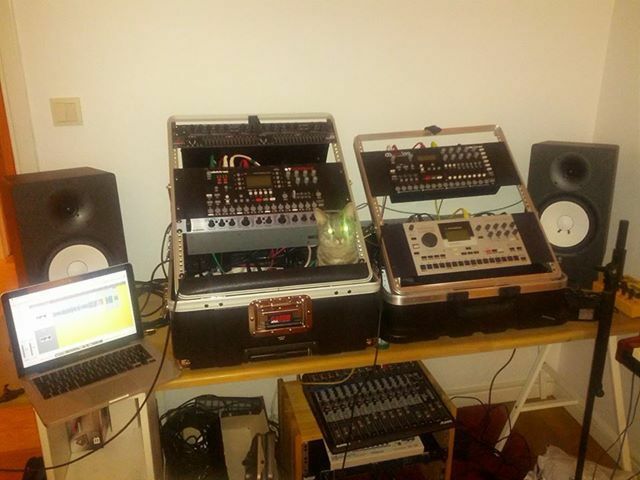 Mac with a bunch of software and plugins (Ableton Live 9 Suite, NI Komplete etc). The fun is back and I am spending more and more time with my setup again. Purely for hobby though. This was over a period of 15 years by the way…I never had all of this at the same time. 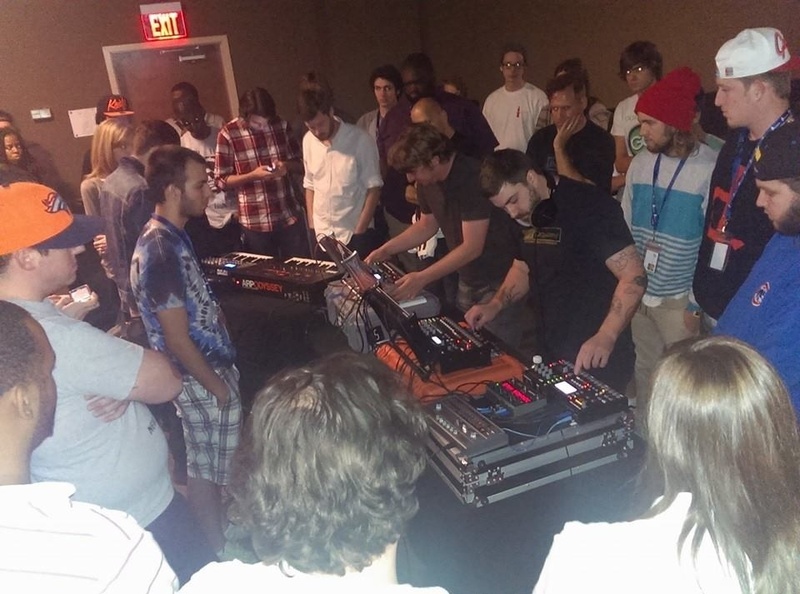 This is us (systems of memory) performing at our Atlanta Synth Club meet the other night. 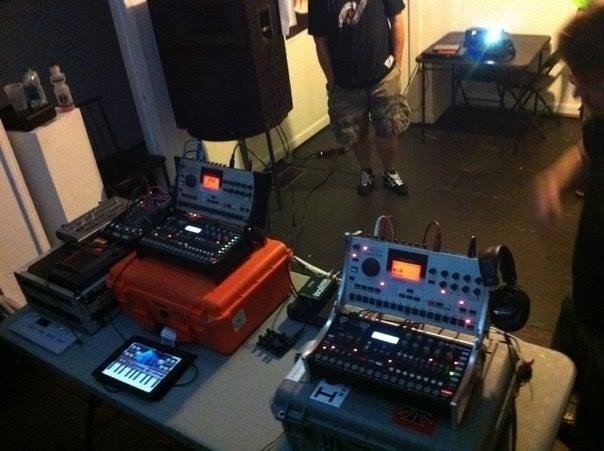 My set up is on the left (orange pelican and black case) and Christian is on the right (silver pelican). 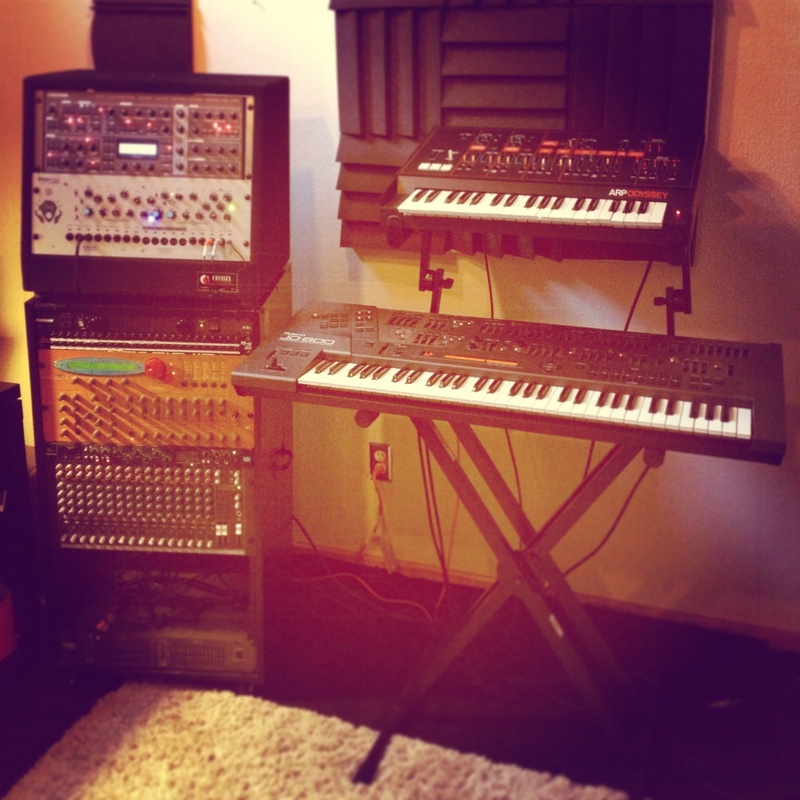 Also my arp and rack on the far right. Rack has virus ti2 and Sherman fb2 in it. My current setup. Very minimal, but it will expand in the near future. 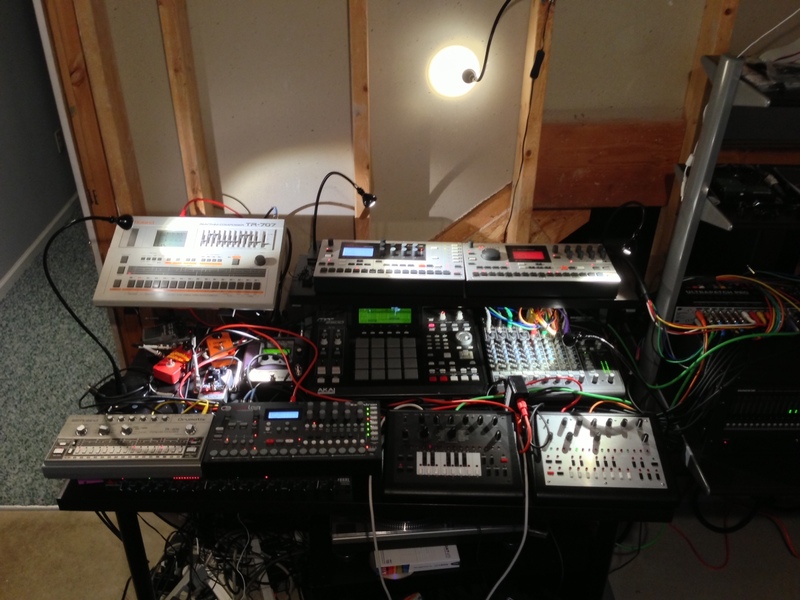 Incoming are at least an Octatrack, an analog mono, an Ambika, some FX, if I get really wild maybe even an API Lunchbox and a bunch of 500-series stuff for that. 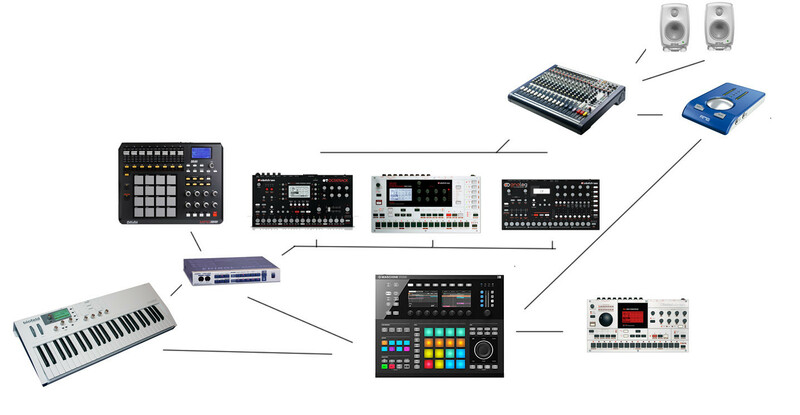 Maschine Studio as control hub with one MIDI out to MIDI-patchbay, which then goes into the MonoMachine, Analog 4 and the Octatrack. 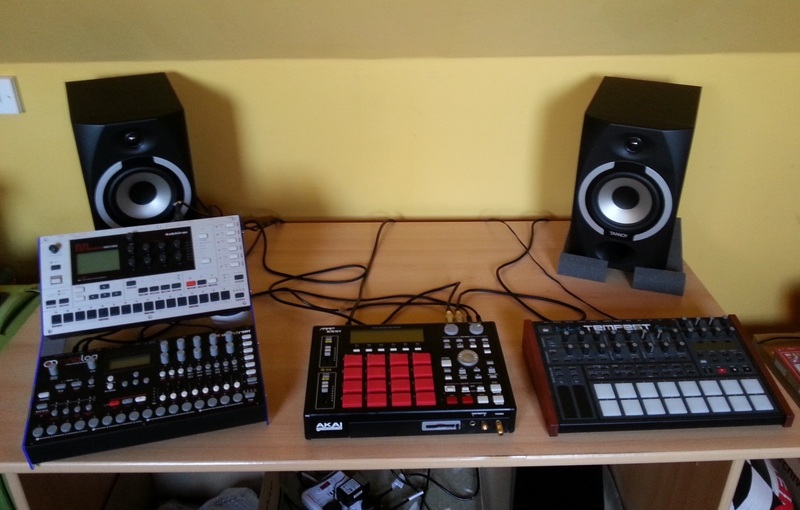 Two direct MIDI outs from Maschine Studio to Machinedrum and Blofeld Keyboard respectively. MIDI out from MPD32 either directly into Maschine Studio or via MIDI-patchbay to control volume of tracks in Maschine Studio and other effect parameters. Also using the pads for tracks on/off. 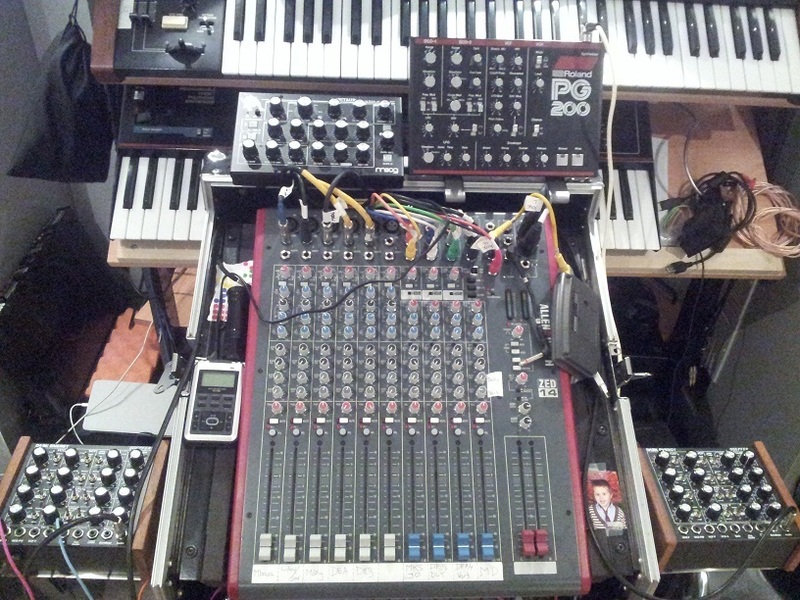 Blofeld Keyboard via MIDI-patchbay as master keyboard (if needed). 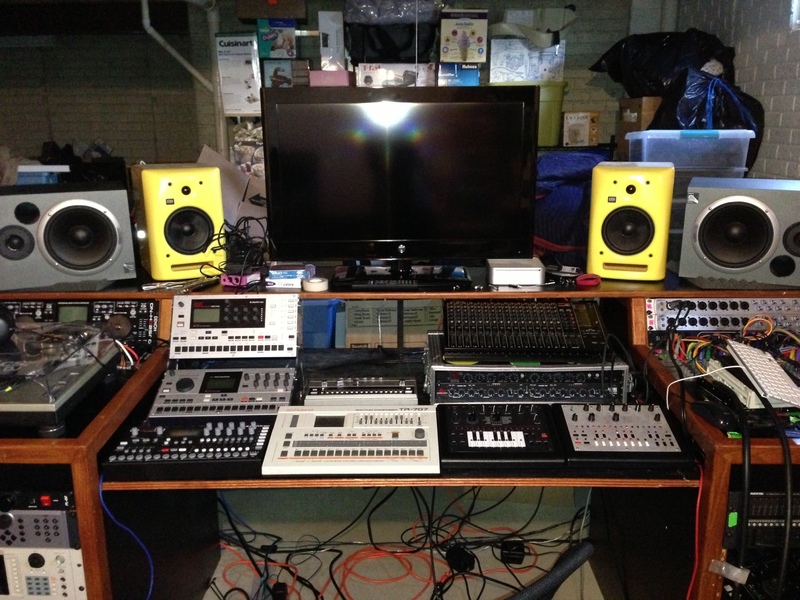 Everything goes into the Soundcraft-mixer, into the RME Babyface, and possibly back into Maschine Studio. Ideally I’d like to route all audio inputs back into Maschine Studio for mixing, but not sure if it’s going to be possible or if I can afford the necessary gear for it. Really stoked about this though, it’ll be sweet! This is my improvised setup. I had the Pioneer DJM-800 already and so i’m using it temporarily for music production, works great and has a decent effect section too. The counterpoint is: I’m deejaying less. Thus i spend more time programming the MD and my Bass Bot. A MM is on the way and in the near future i’m gonna get an Allen & Heath ZED-22FX to be prepared for further instruments and a Bass Station II for additional bass and as a midi controller. how do you like the bass bot? I didn’t have the chance to directly compare it to a real 303 or some other clone, but as far as i can tell it comes pretty close to the original. The programming is easy plus it has some useful extended functions. Unfortunatly, the quality of the fabrication is kinda poor. The plastic housing looks and feels cheap and the knobs are slightly grinding on the front panel (no noise, though). 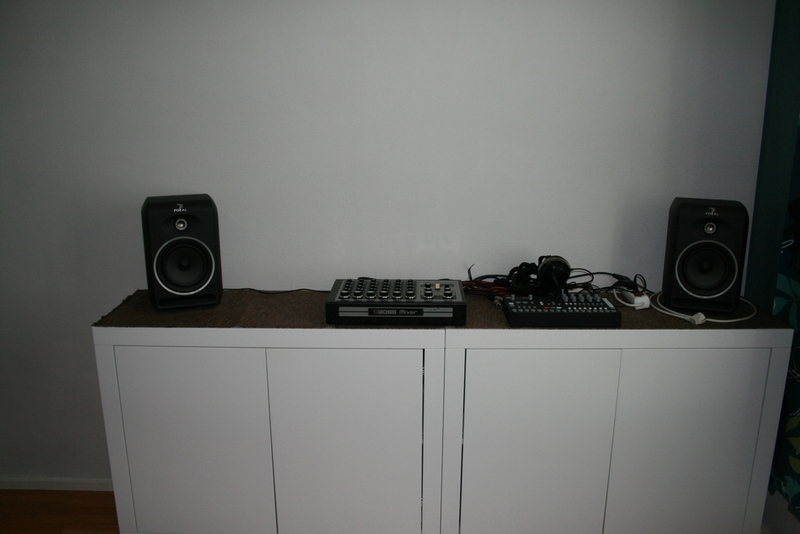 Next to the Octatrack is a DIY mixer where I can mute the machines and cue them to my headphones. It also has individual sends for the machines to the Pitchfactor + KP3. And beneath the OT is a Behringer Ultrazone ZMX8210 preamp for the six inputs that can be routed to the OT’s inputs. [quote=“prettyboy”]how do you like the bass bot? 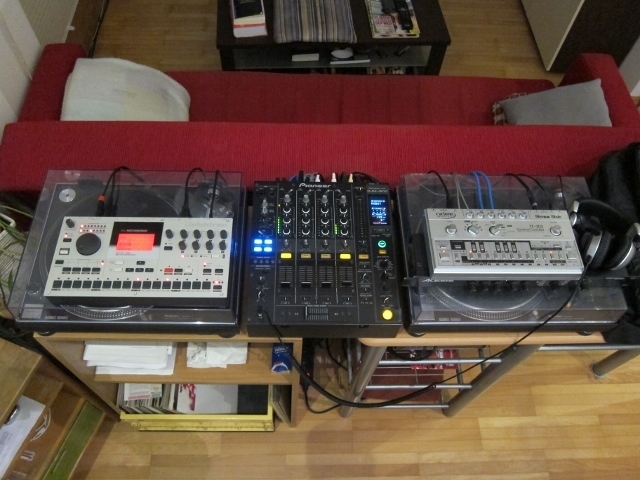 well, in a couple of days i’ll have my own tt-303! 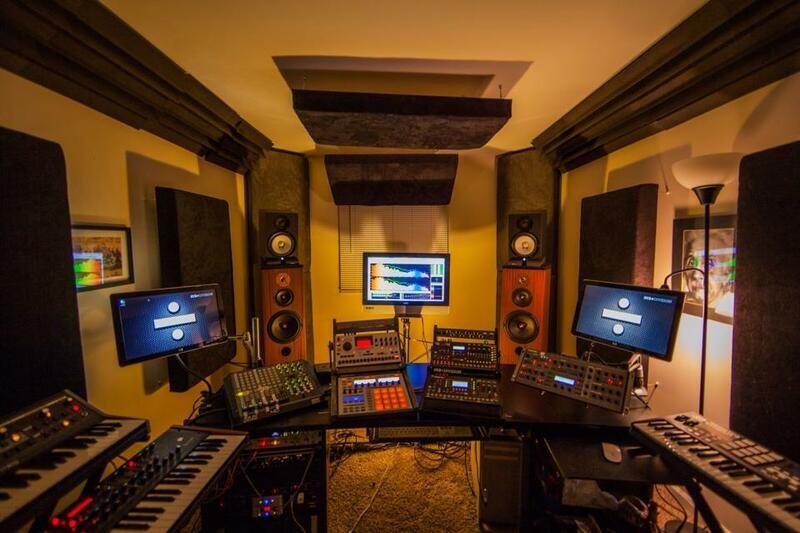 how does it integrate with the elektrons? easy to sync the OT with the bass bot if you’re using the bass bots sequencer? i’m so ready to get some acid grooves going on!!! how does it integrate with the elektrons? easy to sync the OT with the bass bot if you’re using the bass bots sequencer? Works fine. I don’t own an OT, on the MD you just have to switch Ctrl and Tempo out to on. First i had a little lagging problem but it was fixed with an update of the Bass Bot firmware. Wuuuut cannot share photo’s any longer… Filesize is too big… If I can’t take photo with my ipad, and share it with peeps…what’s the point… But hey - my setup looks kool - trust me!